This course is designed for undergraduate students looking for an understanding of the important role that Brazil is playing on the global stage. In the past several years, Brazil has assumed a more prominent voice on global trade and energy issues. As the global financial crisis took hold in 2008, Brazil appeared poised to recover more quickly than many others mainly due to strong industrial and agricultural exports. Brazil's economic rise has led it to pursue greater influence in international forums at the same time that it fosters cooperation among countries in the developing world with "south-south" initiatives. Moreover, the selection of Brazil as host of the 2014 World Cup and 2016 Olympics has put the country in the international spotlight as the government accelerates its economic development in preparation for these events. Analysts say that the United States stands to benefit from a stronger Brazil that serves as a partner on energy and regional security initiatives, but it must be careful not to view Brazil's rise as a challenge, or, during a time of great economic turmoil, neglect the relationship. For some, international relations means the diplomatic-strategic relations of states, and the natural focus of International Relations is on issues of war and peace, conflict and cooperation. However, in an intensely globalized world, International Relations had to shift its focus towards the intensification of cross-border interactions and interdependence between countries, approaching important issues such as: world politics, world economy, social tensions, environmental problems, trade negotiations, state and non-state institutions. International Relations is the study of the complexities and the ever changing dynamics of the international scenario. Brazil’s rise as a great power raises important questions about how that power might be used in its relations with other states. This class explores the rapid growth of Brazil on the global stage, with a reflection in the interactions among Latin American states and between Brazil and other states. Topics include: Sustainable Development, Theory and Policy; Transitions from Authoritarian Rule; Civil-Military Relations; Transition to Democracy; BRICS; Emerging Markets; Parties and Elections in Brazil; Religion; Political Mobilization; and Civil Society. Upon the successful completion of this course students will be able to understand the causes and consequences of Brazil’s recent rise on the global stage. (1) A brief theoretical approach to the International Relations field (2) Discuss the basic concepts of Brazilian Foreign Policy through a brief social and historical approach. (3) To familiarize the students with the historical debates surrounding the formulation of the main tenets of the Brazilian Foreign Policy. 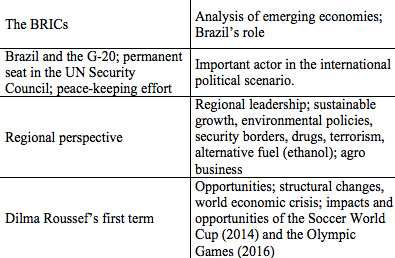 (4) Offer many methodological approaches that permit students to construct a critical assessment of the Brazilian Foreign Policy. (5) To stimulate the analysis of foreign policy as an important mechanism for the development of a solid professional in International Relations. Undergraduate or graduate-level students from all majors are welcome to apply. See application guidelines for requirements. Teaching methods used in this course include lectures, case discussions and group assignments. Learning in this course requires the student’s constructive participation and active involvement in both class discussions and small group discussions. Small group discussions, in particular, are a key mechanism for facilitating learning from other team members. Additional readings will be assigned by the professor. Weekly required readings average approximately 175 pages. These readings are designed to acquaint students with core paradigms in Brazil, as well as some of the most well known or well done empirical studies. Additional recommended readings and websites each weak will supplement the required readings. All of our courses are designed with a modular format. Students should expect to cover at least 80% of the content per module, depending upon the Session selected, in addition to the "Introduction to Brazil" materials. With a focus on political and cultural issues, students will visit Brazilian companies and organizations and will engage in cultural visits. These visits will be integrated back into the classroom during our daily "debrief" sessions called "Introduction to Brazil". Students should expect to be in class in the morning, and to have professional visits to leading Brazilian and international companies in the afternoons. Class schedules are posted online. Founded in 1961, ESPM (Escola Superior de Propaganda e Marketing) established itself as a center of excellence in the teaching of administration, marketing, international relations and communications. It is among the elite few in Brazil to receive the highest grade in evaluation by MEC (the Brazilian Ministry of Education).